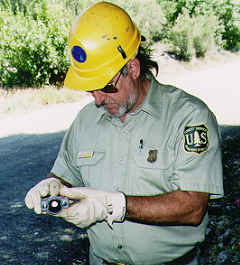 Rangefinders are used to measure distance in a variety of applications for various resource needs in the U.S. Department of Agriculture (USDA) Forest Service. Many different types of rangefinders are commercially available and there have been recent advances in rangefinder technology. The cost of rangefinders varies from $60 to $12,000. Performance varies as much as cost. Significant factors in evaluating performance are range, accuracy, ease of use under field conditions, size, and weight. The required accuracy varies accroding to the application or the task being performed. Typical applications include determining the distance to surrounding trees from a plot center, determining the distances from one fixed point to another as in traversing, and calculating tree heights. 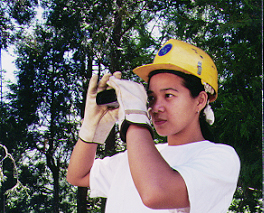 In addition, rangefinders can be used to help determine the volume of a specific tree or stands of timber. The current trend, in the USDA Forest Service and other agencies, is to use more tree measurement sales with lump sum payments. Consequently, it is imperative that the volumes stated in the contracts be very accurate. Some rangefinders are very accurate, lightweight, and compact. Others are heavy and cumbersome. The size and weight of equipment carried in the field vest is a consideration for applications which entail walking long distances or on steep terrain. This test was designed to evaluate the performance of various rangefinder devices. The range, accuracy, size, and weight of these devices were compared. Test workers were surveyed for their opinion regarding ease of use. Comments were solicited on what effect the weather or other field conditions appeared to have on the readings. Additional performance features were noted. The project goal was to provide information to the field on the performance of various laser, ultrasonic and other current rangefinder devices. There is potential for considerable cost savings for field personnel using this information when selecting the appropriate rangefinder for the application. Ultrasonic distance-measuring devices use a wide band frequency from a transducer, sending out narrow beams of sound waves which “bounce” off an object. The return signal is picked up by a hand- held receiver. Accuracy is effected by the position of the receiver, outside sound waves, and noise. Noise generated by wind through the trees or brush, streams, rain, crew conversations, road traffic, or birds chirping can effect readings. When a horizontal distance measurement is being taken, the inclination or horizontal position of the receiver is critical. An outgoing wide band signal will be scattered, increasing the error, if the transducer is not positioned as close to horizontal as possible. Optical distance-measuring devices typically use the coincidence method of determining distance; which uses a series of lenses and mirrors to produce a double image. The double images on mirrors are brought together by rotating a dial until both images merge into one. The dial has a distance indicator. When the two images merge, the distance to the target is read directly off the dial. Pulse lasers determine distance by measuring the amount of time required for a pulse of infrared light to travel to the target and back. The speed of light is constant, so this amount of time is directly proportional to the distance. Many pulses are sent out and returned for each shot, improving the accuracy of the calculated value. Laser instruments are narrow band and require the operator to aim with some accuracy. The accuracy and maximum range of some laser instruments are dependent on the reflectivity of the target. Some laser instruments are affected by the power level of the batteries. The rangefinders selected for testing were identified as representing the majority of commercially available rangefinders. In addition, rangefinder test devices were screened as meeting specific minimum criteria, appropriate for current typical applications. The minimum criteria for this test included size, weight, cost below $4,000, and no need for the placement of reflective target in order to obtain a measurement. The test devices were assembled and calibrated in accordance with manufacturers' recommendations. All ranges listed within the following product descriptions are manufacturer-rated ranges. Measures units as small as 0.001 feet. Calculates height, horizontal, vertical, and slope distances, cumulative and difference distances, and inclination. Equipped with data storage and retrieval via serial interface using an RS-232 port, accessed with a LEMO 4-pin to DB 9-pin cable or LEMO 4-pin to HP 200/48 10-pin cable. Operates as a laser device with a range of 5 to 32,000 feet with the use of a reflective target. Figure 6—Laser Atlanta Advantage rangefinder. Figure 7—Swarovski Optik RF-1 rangefinder. 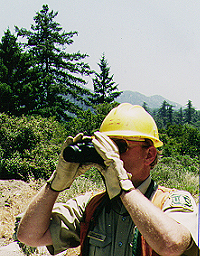 Testing was conducted on the Mount Baldy Ranger District of the Angeles National Forest. The same target was used for all devices, so the measurements could be compared with statistical validity. Flagging was placed on the target at diameter breast height of 4 feet 8 inches. 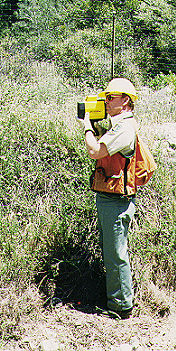 An Electronic Distance Measuring (EDM) infrared rangefinder was designated as the reference device used to measure the true distance (i.e., standard measurement). A professional land surveyor team used the EDM to measure all data points from the target, forward and backward. The range of distance was 500 feet. All devices were tested at 10-foot increments, up to 100 feet, then continuing at 25- foot increments up to 110 percent of the maximum manufacturer's rated range, or 500 feet, whichever was greater. Three operators were selected to participate in testing, all of similar height. 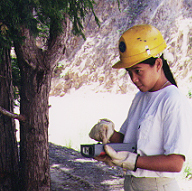 Two operators were experienced in taking slope distance measurements. Accuracy denotes the absolute nearness to the truth. In contrast, precision denotes degree of repeatability in the taking of a measurement. The range of percent differences is an indicator of precision. The data reduction results are presented in table 1. The percent inaccuracy is the inaccuracy specification that could be met at the 95 percent confidence level. Assumptions are made that the data here was not a 1-in-20 or rarer anomaly and that the test measurements follow a normal distribution with the mean equal to the standard measurement. From these results, the smallest inaccuracy standard is met by the Laser Atlanta Advantage, followed closely by the Impulse 200. Percent bias indicates whether the tool consistently over- or under- measures values. Bias can be used as a correction factor for measured values to obtain the true value. This correction factor is specific for each tool and may vary across the range of measured values. The percent bias values in table 1 were averaged across the range of values. From these results, the smallest bias standard is met by the Laser Atlanta Advantage, followed closely by the Impulse 200. Percent differences were calculated between the standard measurement and the test device measurement. The smaller the range of percent difference, the better. The smallest range of percent differences is met by the Impulse 200, followed closely by the Laser Atlanta Advantage. Table 1—Rangefinder Data Reduction Results. There was minimal difference in measured values, percent inaccuracy, percent bias, and percent differences between inexperienced and experienced operators. The same target, a market section of bark, was used for all operators. No reflective targets were used in the testing. Surface finish, color, size, and shape of the bark affect reflectivity and range. All readings were taken at the same height and on the same tree surface. No optional monoscopes for distant viewing were used, only built-in monoscopes. No monopods or tripods were used for mounting. Test conditions were the same for all operators. As recommended by laser rangefinder manufacturers, all testing was conducted with fresh batteries for each operator in order to avoid varying performance caused by battery decays. 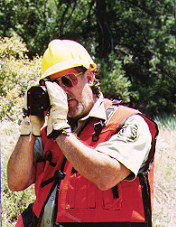 Operators noted that rangefinders are much easier to carry through the workday with the use of a neck strap or shoulder yoke. Some rangefinders provided neither. Both neck straps and shoulder yokes are readily available commercially and easily adaptable to the rangefinders used in this study. User manuals were supplied with all rangefinders and were available to all operators before testing. Brief verbal instructions were also given to all operators. An attempt was made to shoot through light, medium, and dense foliage with the test rangefinders. Only the rangefinders with a filter were able to shoot through brush and only on a limited basis. In addition to accuracy testing, each operator was asked to subjectively rate the instruments on a scale of 1 to 8, with 1 being the most favorable. The ratings are as indicated in table 2. Table 2—Operator Rating of Test Instruments. Test operators were asked for comments regarding the rangefinders immediately after testing was completed. Their comments are as indicated in table 3. Table 3—Comments on Rangefinder Test Units by Operators Immediately After Testing. Sonin 60 Fits easily into cruiser vest pocket. absolutely level to tree to get good reading. handed use. Hand strap. Confusing to operate. Does not look weatherproof. not magnify, so target is hard to see at far distances. reading on the instrument face (0.1 foot). button only. Reading inside the viewer. the 1 yard (0.9 m)measurement. Feels topheavy. Ranging 400 No batteries. Inexpensive. Hard to focus. Takes longer to use. Hard plastic eyepiece. Small eyepiece. Difficult to operate. Table 4 provides a comparison by range, price, weight, and size. Table 4—Comparison of Range, Price, Weight, and Size of Test Instruments. range, up to the maximum manufacturer range was not tested. See Instrument Descriptions. This report includes information on rangefinder descriptions, percent inaccuracy, percent bias, user comments, user rankings, cost, weight, and size. The user in the field has an indepth knowledge of what is required to get the job done. Consequently, with this knowledge base and the results of this comparison study, the user is equipped to determine the best instrument for the job.